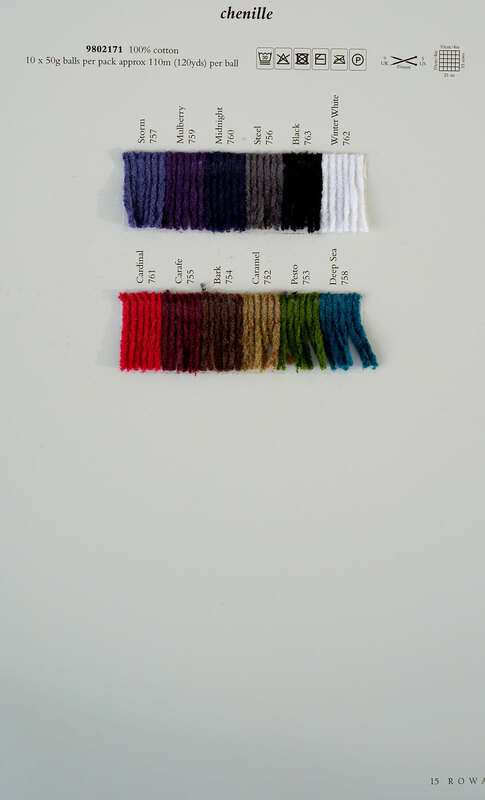 Yarn Type 100% cotton, soft and yet textured to the touch. This yarn takes cables and textured stitches very well. Available in strong jewel like colours and in a 50 gram ball it is ideal for colour work, mixing with other Rowan core yarns, but equally makes very wearable and warm garments when knitted by itself. Maschine wash warm. A collection of 12 womens garments and accessory designs using one of Rowans new yarns for the autumn/winter 2014/15 season Chenille.The beautiful Rowan Chenille is a fine cotton chenille yarn available in 9 sumptuous autumnal and velvety shades.Featuring designs from Marie Wallin, Martin Storey, Lisa Richardson, Sarah Hatton and Gemma Atkinson. This very wearable collection has pieces ranging from wrap over cardigans ,cable and weave textured knits to colour blocked and simple rib sweaters. Knit and crochet this homeware cushion from Rowan Knitting & Crochet Magazine 56 as an exclusive free download, a design by Marie Wallin using Chenille (cotton) for the pillow and Wool Cotton (wool and cotton) for the braid strips. This rectangular cushion is knitted in simple stocking stitch and brought to life with these pretty contrasting crochet strips. This free pattern PDF has also been translated into French, German, and Dutch. Knit this fabulous homeware cushion from Rowan Knitting & Crochet Magazine 56 as an exclusive free download, a design by Lisa Richardson using the beautiful yarn Chenille (cotton.) This stocking stitch cushion is adorned with 25 flower squares which are held together with yarn covered buttons. This free pattern PDF has also been translated into French, German, and Dutch. Knit this homeware bed runner from Rowan Knitting & Crochet Magazine 56 as an exclusive free download, a design by Marie Wallin using the beautiful yarn Chenille (cotton.) This bed runner is worked in a woven pattern to give it texture. This free pattern PDF has also been translated into French and German .